This personalized pillow is a tribute to your favorite adventurous little person. 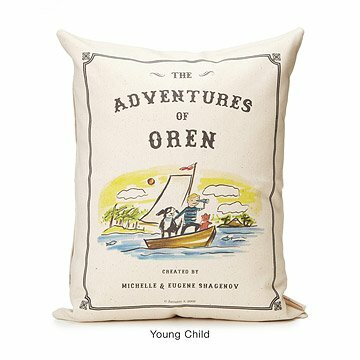 Cast your favorite little person as an adventurous literary figure--whether a newborn making a debut or a young child in the first few pages of his or her adventure--with this delightfully personalized pillow, featuring custom, storybook-inspired illustrations on each side and your custom rave "review." For newborns, it's an imaginative antidote to ordinary birth announcements; for young children, it commemorates the magical story of early childhood. For all, it's a soft, safe, and huggable tribute to each child's precious individuality. The charming illustrations by Patricia Carlin evoke timeless storybook classics, creating a unique and memorable custom pillow that will transition from nursery to bedroom to grown-up keepsake. For more storybook titles, check out our Personalized Storybook Pillow - Amazing, Personalized Storybook Pillow - Brave, and Personalized Storybook Pillow - Legend. A whimsical nod to the joy of reading! This heirloom quality pillow was so appreciated by one and all! My daughter-in-law was over the moon with the unique, endearing, and beautifully illustrated "story" her baby boy received, and raved about it to her family and friends. Thank you Uncommon Goods for always providing products that I am proud to give as gifts and bring such joy to the recipients! It was a gift and is treasured by his mom and dad. I want my grandson to use this constantly and be rough or gentle as he wishes as the cover is tough, washable and durable. He will remember this pillow into adulthood, an ongoing part of life. This is the most darling personalized present for a new baby. I've bought this pillow for every friend or relative who have had a baby in the last year or so. We always receive the most sincere thank you notes about this being their favorite gift. It's such a nice gift to give! i'm always looking for new personalized products to celebrate the birth of a child. i bought this for my great-nephew and my nephew went gaga about it. what a classic design and adorable way to express our congrads! Love the pillow!!! It's even cuter in person than it was online. My sister loved her unique baby gift. We gave this as a newborn gift for the first grandchild of our close friends and received the following thank you note from the parents: "Thank you so much for the absolute coolest baby gift. We love "The Adventures of Dorey" and know that Dorey will love snuggling up to it as an infant and see the humor in it when she gets a little older." Very cute pillow. My niece was thrilled with it!